← Complementary medicine vending machines (with coke)… has it all gone too far? The School of Public Health and Preventive Medicine (SPHPM) Summer Vacation Scholarship Program supports the education of promising tertiary students by providing a means to engage and gain experience in research during the University summer vacation period. The program is open to students completing degrees in Bachelor of Health Science, Bachelor of Public Health Science, Bachelor of Biomedical Science, or Bachelor of Medicine and Surgery. Students work with a senior researcher and their team to undertake a small research project, or contribute to current research in applied clinical and public health. Since 2011, SPHPM has provided scholarships to approximately 20 students each year to participate in the 4-6 week program. The aim is to give students insight into opportunities in the growing area of public health research and an incentive to pursue higher studies and a career in research or academia. 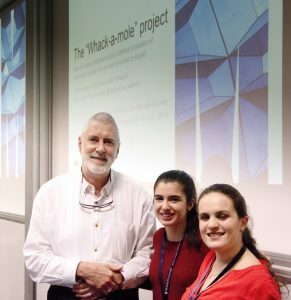 In 2016, two Monash Biomedical Science/Law Summer Scholarship students (Sasha Hall and Tiana Moutafis) worked with me on our “Whack-a-mole” project.This involved submitting complaints about the promotion of complementary medicines to the regulators, media engagement and a submission to the TGA on regulatory reform. Which one do you think won the award for best presentation? Additional students involved in the Whack-a-mole” project earlier in the year (along with Sasha and Tiana) also featured in a recent ABC Four Corners program: “Swallowing It: How Australians are spending billions on unproven vitamins and supplements“. This entry was posted in Complementary medicine, Pharmaceutical Promotion and tagged "Whack-a-mole" project, AHPRA, Complaint Resolution Panel, Monash University, Regulatory Reform, School of Public Health and Preventive Medicine (SPHPM) Summer Vacation Scholarship Program, Therapeutic Goods Advertising Code. Bookmark the permalink.